Black Raven Media, LLC Launches New Website for Jewell Homes, Inc.
Today, Black Raven Media announced the launch of a new website for new client Jewell Homes, Inc. This comprehensive site supplies families, couples, and individuals the information necessary to design a custom home or to build a new one. The website offers UX design which provides superior search capabilities, easier navigation, and furnishes more educational content. 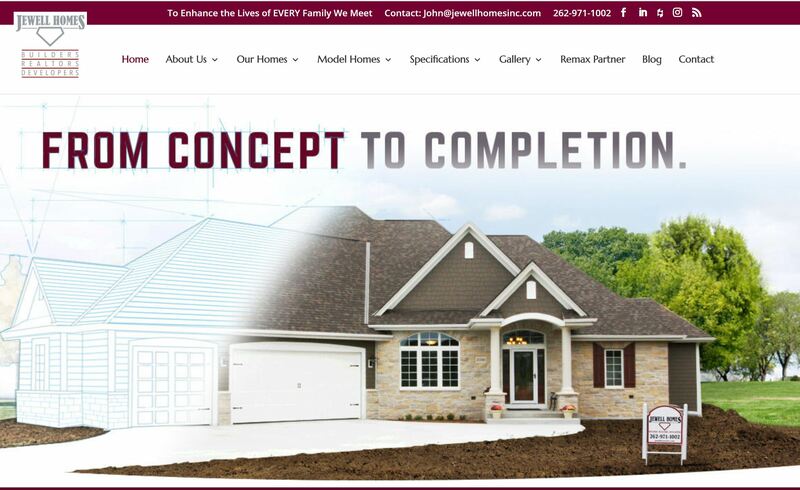 Jewell Homes new website also provides current and potential clients easy access to weekly online blogs to stay up to date regarding design trends, industry news, product comparisons, and more. This gives the viewer a first-class online experience. The site also offers clients access to the Co-Construct Home Building Software. This is the highest rated software available for professional construction teams and is designed to help the client have the best home building experience possible. Clients will have project information right at their fingertips and will be able to keep track of all the details of the home building process. The updated look and ease of use will draw in potential clients and show them the home designs they’re looking for and the best building experience possible. Clients will have their project literally at their fingertips – they’re just a click away from vital and helpful information. Based in Milwaukee, Wisconsin, Black Raven Media is the producer of the well-branded television show Builders Showcase. This digital agency is best known for the success they have brought to the home improvement, home building, and remodeling industries. Black Raven Media specializes in website design, Search Engine Optimization (SEO) campaigns, PPC, and creates content marketing, design branding, and interactive web solutions. The company builds award-winning and multi-platform applications and websites, and they boost online exposure and increase social networks. Everything to help your company rise above all others. In addition, Black Raven Media is the parent company of Builders Showcase Television, their Magazine, and Builders Showcase 360 Digital. Debra Lopez Public Relations, LLC is an associated Milwaukee-based Digital Agency and Public Relations Firm focused on the development and implementation of company publicity and brand awareness, advertising campaigns, social media, and search engine optimization. Founded in Muskego, WI, Jewell Homes is a family owned company that doesn’t build houses – they create homes. They believe that all families should be treated with respect, integrity, and honesty. Jewell Homes offers their customers the best products available, with quality installers, at a fair price, all backed by the finest warranty in the building business. Whether clients are interested in a ranch style residence or a 2-story, Jewell Homes can customize the features to exactly what the client wants. The staff will work with them to make the best decisions for their lifestyle and budget.